They’re overwhelmingly tall. They ride their bikes everywhere (without helmets). They’ve conquered sea level. And now, they’re ranked #1 in English. In the most recent EF English Proficiency Index (EF EPI) ranking, the Netherlands came in 1st out of 72 countries in English skills. 90 percent of respondents in the Netherlands claim to know English. It can’t just be their astoundingly liberal policies about weed that put Dutch so high in the rankings. 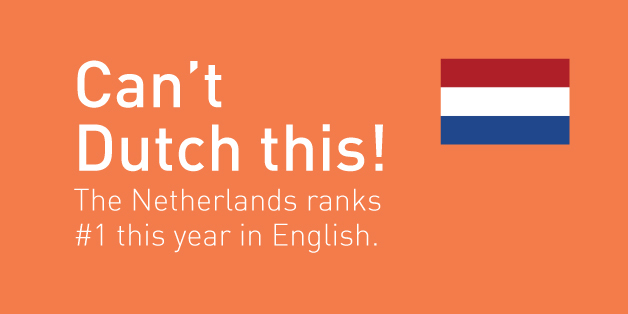 These results beg the question: Why are the Dutch so damn good at English? This tiny country of 17 million people punches well above its weight with the 17th largest GDP in the world, and the 5th largest in the EU, according to the IMF. While South America or the Middle East can rely on a sizable Spanish-speaking or Arabic-speaking market to drive growth, there are 27 million Dutch speakers—and 2 billion English speakers. And so the Dutch have needed to learn English to enter the global market. The Netherlands doesn’t dub foreign language TV and movies. As a result, Dutch children grow up hearing English in popular culture from a very early age. Countries with a large enough audience for dubbed TV programs and movies, like France or Germany, dub everything, and as a result, have much less success in integrating English into their cultural life. Dubbing seems to render people linguistically numb to foreign languages, a condition the Dutch have successfully avoided. The Dutch have always been enterprising—the Dutch East India Company was established as the world’s first multinational company in 1602. That same year, the first modern stock exchange was set up in Amsterdam to facilitate international trade. The country’s business-friendly legacy lives on as many iconic multinational companies (Royal Dutch Shell, Unilever, Heineken, and IKEA) are headquartered in the Netherlands. The Netherlands is in a self-perpetuating cycle where strong English leads to strong business, which in turn encourages the best English proficiency in the world. While the Flying Dutchman is the stuff of legends, make no mistake: the Dutch love to travel. The education giant, EF Education First, has witnessed steady growth in the Netherlands of students who travel abroad and take gap years since EF’s Amsterdam office opened in 1970. English opens doors not just economically, but also for the average Dutch tourist, and so it’s no wonder why there’s interest in this global language. Before any English test, the Dutch can thank their linguistic ancestors. Dutch is a Germanic language, just like English, and so they share many roots and characteristics. De? The. Bier? Beer. Wafel? Waffel. While many language families don’t talk at the dinner table, cross-language similarities give the Dutch something to say when it comes to learning English. The Dutch have an embarrassment of riches when it comes to English skills —and benefit from it enormously. Anyone who remembers that New York was once New Amsterdam will know that the adventurous Dutch have always been a country with global ambitions.Countries a little further down the EF EPI’s English rankings ladder should pay attention. The Netherlands is a great example of how a country’s English proficiency can make it globally competitive and future-friendly. Adds a whole new meaning to the phrase “going Dutch,” doesn’t it? What do you think how the Dutch speak their languages? This was originally published on Huffington Post by Ming Chen.